a dear friend rang yesterday with the news that she was diagnosed with stage 3 breast cancer back in October, she’s had 2 months of weekly doses of chemo with another 2 months of chemo once every 3 weeks until early February when her breast will be removed surgically followed by the radiant rays. 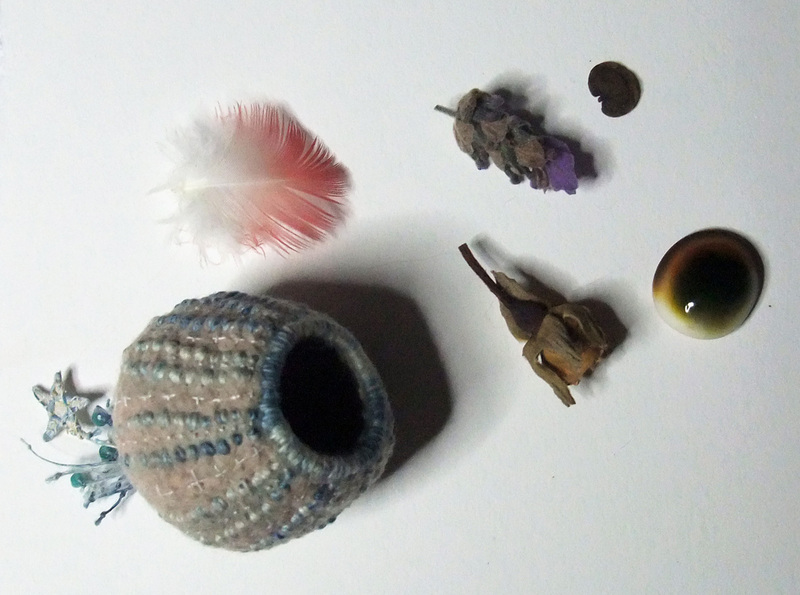 then filled this little sea urchin pod I stitched earlier in the year with a pink galah feather, a sprig of lavender, Cecil Brunner rosebud, Honesty seed and a Cat’s Eye shell for her to hold onto and ordered a copy of You Can Conquer Cancer by Ian Gawler, a spirit wise book that helped me 14 years ago with getting through the treatment for throat cancer. Be Strong my beautiful inspiring friend, we need you on the planet! (((Nancy))) thank you for the good vibes! (((Els))) loving friends are so important to the healing, prayers, white light & good vibes all help to keep the spirit up, acupuncture to keep the energy lines flowing, crystal healing and meditation to calm the soul and red papaya saved my life when nothing else was edible. Big hugs and healing Blessings .. Cancer just the word fills my heart with memories of those I know that have won and lost the battle. The photo of your necklace of staples is crazy proof that Cancer can be beat. Praying your friend lives to treasure your amazing heartfelt gift for many many years. Most beautiful offering here Mo and may your friends courage endure.. Returning to that 2013 post surgery link while listening again to Old man Crow singing. gave me the shivers. Knowing you continues to be an inspiration. Do they sit alone in little gardens changing colours? I hope your friend’s healing comes for her highest good. (((Dee))) that poem makes me cry with the deep beauty and soul wonder of those angels we meet in the most unexpected places! Sending that white healing light to your friend Mo, may she become healthy and happy soon…..
I’m sure your tiny talisman of love surrounded by love and white light will be something she can hold close to her heart and feel its healing powers. What a wonderful gift from you to her! 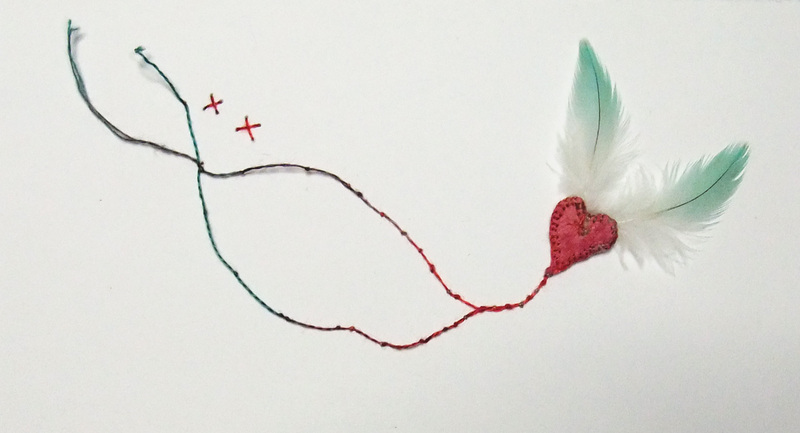 Dearest Mo, that is a strong & powerful healing talisman for your friend, I pray her love & comfort in her ordeal & may she emerge at One with herself in the best possible outcome for her. Such a beautiful gifting, so thoughtful, such deep magik. Blessings.